India Steele is desperate. Her father is dead, her fiancé took her inheritance, and no one will employ her, despite years working for her watchmaker father. Indeed, the other London watchmakers seem frightened of her. Alone, poor, and at the end of her tether, India takes employment with the only person who'll accept her - an enigmatic and mysterious man from America. A man who possesses a strange watch that rejuvenates him when he's ill.
Matthew Glass must find a particular watchmaker, but he won't tell India why any old one won't do. Nor will he tell her what he does back home, and how he can afford to stay in a house in one of London's best streets. So when she reads about an American outlaw known as the Dark Rider arriving in England, she suspects Mr. Glass is the fugitive. When danger comes to their door, she's certain of it. But if she notifies the authorities, she'll find herself unemployed and homeless again - and she will have betrayed the man who saved her life. 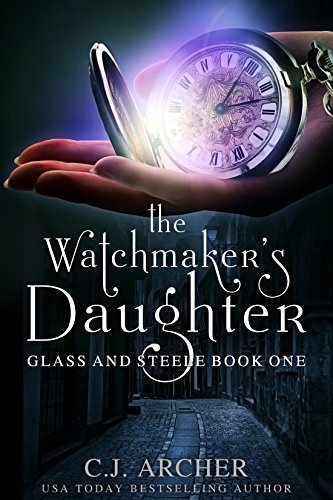 With a cast of quirky characters, an intriguing mystery, and a dash of romance, THE WATCHMAKER'S DAUGHTER is the start of a thrilling new historical fantasy series from the author of the bestselling Ministry of Curiosities, Freak House, and Emily Chambers Spirit Medium books.